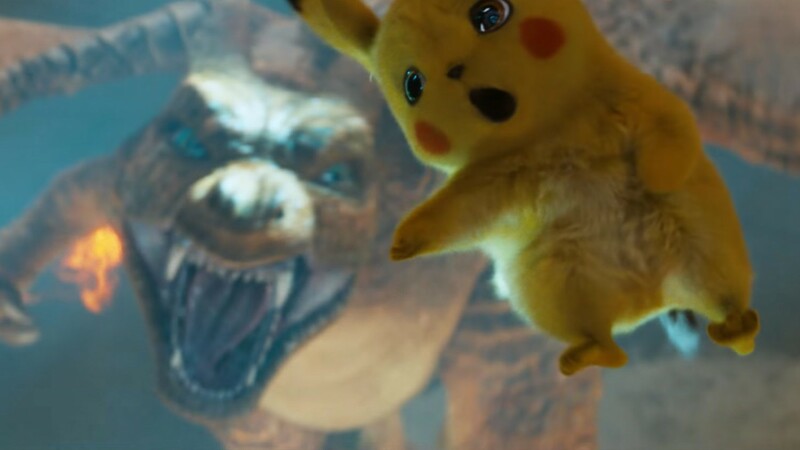 The first trailer for the upcoming Detective Pikachu movie released today, and there is a lot to take in. The Pokémon are furrier and scalier, and there are lots of them. There are plenty you could miss from a casual viewing, which you can see below if you haven't already. Pikachu is there, obviously, Mr. Mime, and Charizard are pretty front and center, but there are a bunch more milling about the background. Here are some that you might have missed. In this scene you can see a Rufflet on the left as well as a Squirtle on the right. Pancham is also standing next to Justice Smith's character's feet, though he is there only for a moment. Psyduck can be seen here standing with Kathryn Newton's character. If the trailer is any indication, it looks like Psyduck is with her the whole movie. There is also a giant Gengar balloon float behind them. There is also a Spoink on the dashboard of the car. It's unclear if it's a real Spoink, or just a dashboard decoration. You can't miss all the Bulbasaur running through the water, but there are also a few Morelull floating around, too. Jigglypuff makes a brief, fuzzy appearance looking very upset. You can also see Machamp and Primeape on the poster on the left. A whole crew of Greninja make a few appearances throughout the trailer. It's not there in person, but a Pancham makes an appearance on a poster. This is a very busy scene. You can see an Unown reference at the top of the image, a group of Emolga on the left, and on the right, I believe there is an Audino, but it's hard to tell. There are a lot of references to unseen Pokémon in the bedroom of Justice Smith's character (we assume it's his bedroom, anyway). His posters call out Rayquaza, Dragonite, Hypno, Articuno, and Steelix, and another poster shows an image of Reshiram facing off against Zekrom. A few of those are legendary, which raises some interesting questions about the universe of this film. And finally, there is a lot happening here, which is why it is in GIF form. You can see a Charmander walking up front, a Bouffalant (we think) and a Dodrio walking in the crowd, a Braviary on the right, and a very hard to see Venusaur on the left. You can also see a few Pidgeots (though they could be Pidgey or Pidgeotto) in the sky as well as a Comfey, some more Emolga, a few Flabébé, and references to Emolga, Turtwig, Wooper, and Victini in the signs on the buildings. We are fairly certain we didn't see every Pokémon in the background so please, let us know who we missed in the comments below!